Julie Price, Clinical Risk Programme Manager, shares a repeat prescribing journey to safeguard your practice. One morning at a GP practice, the receptionist, Ms B, received a telephone call from a consultant requesting a prescription of Diclofenac (50mg tablets) for a patient, Mr S, he had just seen in his clinic. Ms B was extremely busy that morning as there were several surgeries running and the baby clinic. She wrote the message down on a piece of paper. When Dr M, the senior GP partner, was free, Ms B popped in and passed him the request. He asked Ms B to add the medication to the computer and generate the prescription. She duly did this and added the prescription to the pile of scripts waiting to be signed. Unfortunately, Ms B failed to identify that there were two patients with the same name at the practice and the wrong Mr S was selected. Following morning surgery Dr M signed all the prescriptions including the one for Mr S. The prescription was collected by the local pharmacy and delivered to the nursing home where Mr S resided. Mr S was administered the medication by the nursing home staff and further prescriptions of the drug were requested. Following three months of this medication Mr S sadly died following a gastrointestinal bleed. Neither the pharmacy nor the nursing home questioned why the drug was being prescribed and the Mr S who should have received the medication did not enquire as to why he had not been prescribed diclofenac. Following the death of Mr S the police interviewed Dr M under caution in relation to a potential charge of gross-negligence manslaughter, but after several difficult months the CPS concluded that he would not be charged. Dr M wrote a letter to Mr S’s family expressing his deep regret, but he did not receive a reply. MPS undertakes Clinical Risk Self Assessments (CRSAs) of general practices, a systematic approach to identifying risks and developing practical solutions to ensure quality of practice, and preventing harm to patients. 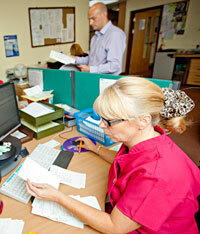 Data from 2012 reveals that 95.7% of practices visited had issues regarding repeat prescribing. Repeat prescribing (RP) is a complex journey involving over 20 steps from the initial decision to prescribe to the patient finally taking the medication. Patients, staff, GPs and pharmacists all have a role to play in minimising error. RP is everyone’s responsibility. Ultimately however the clinician who signs the prescription is legally responsible for it. One way of getting to know your repeat prescribing journey is to hold a process mapping session with all the staff. Using six (or seven, if you are a dispensing practice) simple steps, discuss each stage identifying risks along the way and discussing solutions to mitigate these risks. Are all medications suitable to add as a repeat prescription? Who adds medication to the computer? What is the system for monitoring potentially toxic repeat medication, eg, warfarin, lithium, amiodarone? "Where possible, try and arrange for repeat prescriptions to be signed by a doctor who sees the patient regularly"
What methods are currently available for a patient requesting repeat prescriptions? Are your telephone systems robust? Do you have a standardised requesting slip to ensure all written requests contain adequate information? The most time risky part of the process is the anomaly situation where the requested item is not on the repeat list, or different in some way from the list of repeat medications, eg, medication previously issued but not for some time, over and underuse, change of dose, etc. It is these situations where the GPs must check the computer to establish whether the request is appropriate, check for interactions, arrange monitoring, etc. "Make sure acute prescriptions do not get mixed in with the repeat prescribing pile"
Checks should be in place to check correct drugs are dispensed and are not out of date. Staff should be trained and competent. – Pharmacy – do they sign for the scripts they have collected? Controlled drugs – does the practice keep a record of when these type of prescriptions are collected and by whom? What do you do with scripts not collected? – Prescriptions that are not collected from the dispensary or local pharmacy should be returned to the GP for review before destruction. A system should be in place to regularly review uncollected prescriptions. – To ensure that repeat medication items are not routinely delivered to patients, whether required or not, develop and agree with pharmacists a protocol to make sure only those medications required by the patient are despatched. Once you have discussed the repeat prescribing journey with the practice team, the practice’s repeat prescribing protocol should be amended to include all the solutions discussed. Ensure that all staff are trained in the procedure and have access to the protocol. MPS Educational Services delivers workshops relating to prescribing in primary care. For further details please contact MPS Educational Services on 0113 241 0624.